For a description of the species see Crinum zeylanicum L. Amaryllis ornata, figured in Curtis's Botanical Magazine, common name ‘Crimson and White Amaryllis’, is depicted with white flowers with a distinctly purple stripe in the copy that I have seen, although this may be an anomaly. It seems very similar to Crinum scabrum except that the flower segments are not so widely spread, and are much less reflexed at the tips. It is described as being from Africa and sometimes known as the ‘Cape Coast Lily’. [BM t.1171/1809]. 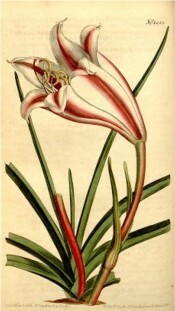 Baker relates Crinum ornatum to C. zeylanicum L. (ref. BM t.1171) and C. ornatum var. latifolium to C. latifolium L. [Baker Am.]. In his description of Amaryllis ornata Ker-Gawler includes Amaryllis broussoneti Red., A. spectabilis, A. yuccoides Thompson, A. zeylanica L., Crinum latifolium and C. zeylanicum Reich. In discussing Crinum distichum Herb., Baker gives Amaryllis ornata Ker-Gawl. [BM t.1253 excl. syn.] as a synonym and states in relation to C. distichum: ‘Hab. Sierra Leone. Differs from C. yuccaeflorum by its distichous leaves. Three different plants are figured as Amaryllis ornata in the Botanical Magazine, viz. C. zeylanicum, giganteum and the present species.’ [Baker Am.]. Of these three figures gigantea, named Amaryllis ornata var. beta by Ker-Gawler, is clearly an error, the remaining two are representative of the differences of opinion between early botanists on the relationship between plants from different regions of the globe. According to Baker Crinum zeylanicum has been known in Europe since 1697. [Baker Am.]. Listed only in the 1843 catalogue and as far as we know not used for hybridising. The earlier plants were presumably lost as they are not listed in the catalogues after 1843 and Macarthur included Crinum distichum (ornatum) among desiderata to Loddiges’ Nursery, 6th January 1845 [MP A2933-2, p.28]. There is no record of it being received. Crinum ornatum (Ait.) Bury, synonym Crinum kirkii Baker, Amaryllis ornata Ait., from tropical Africa, was not described under this name until 1879. The leaves form a rosette at ground level, erect then flaccid, somewhat undulate, 60cm long or longer and 5cm broad. An erect stem, to 60cm high, bears an umbel of about 15 nodding, trumpet-shaped flowers, segments white with a distinct maroon band on the keel, about 9cm long, the upper segments reflexed. [Baker Am., Verdoorn]. Its relationship to Herbert’s Crinum ornatum is not clear to me. Also see Crinum giganteum Andr., one synonym of which is Amaryllis ornata var. beta Ker-Gawl. 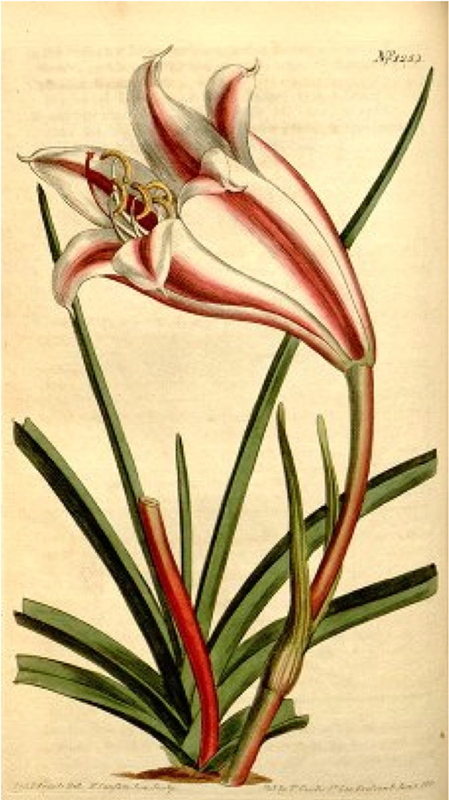 Ker-Gawler gives the common name of ‘White Cape-Coast Lily’ [BM t.923/1806] although it is clearly very different to the plant subsequently published as Amaryllis ornata. It is very unlikely that this plant is William Macarthur’s Crinum ornatum.